New Delhi: The children sat slack-jawed and saucer-eyed watching a woman being sawed in half and being put back together again. Then came the hat trick when a pigeon went into it and emerged as a rabbit. There was more ... a tongue cut into half and rejoined and objects floating in the air as gasps filled the air. But that was all in the past. Today, thanks to the pull of the internet, and its unapologetic demystifying of magic tricks, a magician’s charisma and enigma are fading glories, magicians in India told Gulf News. Children, and adults perhaps, are no longer in thrall of a magician and his sleight of hand. So, to stay relevant, they have to work doubly hard by reinventing themselves ever so often, they said. This has resulted in many of them choosing alternative careers or turning into mind wellness therapists, motivational speakers and spiritual growth trainers. A small-time real estate broker Prakash Pant, 42, who once held magic shows, initially failed to realise the impact of electronic media. Pant went into depression, which further aggravated the family’s problems. His only son dropped out of school and his wife was forced to take up a job. Never too happy with Pant’s choice of profession, his elder brother roped him into his real estate business. Another magician, Gopi too often found himself sitting at home waiting for bookings. Unable to find much work and sensing it was time-out for him, he took up an accountant’s job. Gopi vehemently opposed his son, who wished to follow his footsteps. Their dwelling is devoid of any tell tale signs of a magician’s house. Similarly, Krishan Gopal, 49, now provides consultation for psychosomatic ailments and depression. But at one time, he was doing magic shows, as it was also a childhood hobby. In 2001, Gopal took up magic as a profession. “I used to be a teacher, but the magic bug bit me so strongly that I turned it into a profession. Back then, I would get over 20-25 shows a month, which have reduced considerably. “Magic is a fine art that requires immense practice, but even in the age of technological advancement, some people continue to think that a magician is a tantric (occultist) and approach me for solutions for all kinds of weird problems,” he rued. The allure of magic, its compelling mystery and awe has taking a beating thanks to the reveal-all culture of the internet, said Gopal. Now, during his shows, when he performs illusion tricks such as cutting a girl into three parts, his audience heckles him. He believes this is because they have all read up on the tricks on the internet or seen them deconstructed on YouTube. It has killed the thrill of magic, said Gopal. However, the younger generation seems more prepared. Magician Tulsi, 31, believes in the significance of re-invention. Staying focused on the business needs of restaurateurs, he performs at a city mall. “I have been in the profession for the past one decade and see no reason to change my profession. Improvisation is the key to success,” he says. Despite the onslaught of technology, the tradition of magic still finds its followers in India. Raj Kumar, 56, has been performing as a magician for the past 36 years. In awe of their skills and dexterity to make objects vanish and appear at will, he decided to learn from them. Unable to pay them money, he offered them food grains, which he stole from home. He left studies midway and began working for a company and would often play truant from work to learn magic. “There is a very thin line between magic and science. Magic is mesmerism and a sleight of hand. Only what exists can be conjured up,” he said. From holding solo shows, Kumar has acquired a team of 30 in-house performers, who travel across the globe performing magic tricks. Kumar attributes the general decline in the profession to entertainment options like multiplexes, shopping malls and amusement parks. “As in any other business, a magician also needs to keep evolving. 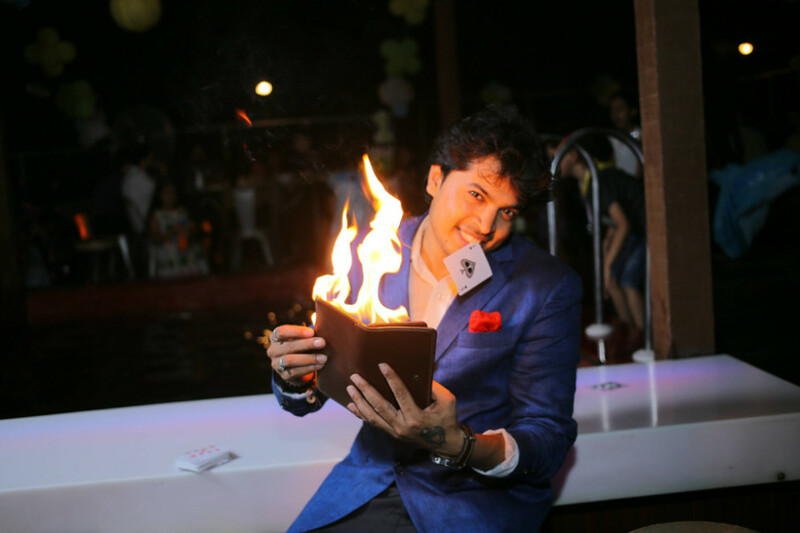 I did my first show for Rs10 (56 fils), but presently, perhaps, I am the costliest illusionist in India charging over Rs300,000 for a 90-minute performance,” he said.